​​Care Angel, an artificial intelligence (AI)-powered virtual caregiver and health care assistant platform, was chosen by AARP Services, Inc. (ASI), AARP’s wholly owned for-profit subsidiary, to participate in its CareConnection initiative to provide support, services and community to caregivers. Care Angel launched on CareConnection this month and is currently the only company featured in the Remote Support section of the interactive online site. Other categories include Telehealth, Diet/Nutrition, In-Home Care, Transportation and Advice and Guidance. In addition to the online site that includes services, resources, articles and other information, ASI will make available a mobile app that connects caregivers to each other for peer-to-peer community sharing of information and advice. Care Angel uses a unique approach to remote care monitoring technology to help older adults remain independent, healthy and productive. Care Angel offers a virtual caregiver assistant called ANGEL: (A)utomated, i(N)telligent monitorin(G), car(E)giving p(L)atform that keeps seniors healthier, happier and more independent at home while maximizing caregiver time, providing real-time specific health and wellness information about the loved one, delivering trusted health data and bringing better peace of mind to the family caregiver. The technology delivers a higher-touch, yet lower-tech caregiving model by reaching out to the seniors using a traditional landline or cell phone and keeping the caregivers informed via smartphone app. Care Angel is a mobile app that family caregivers can set up to check in on the health and wellbeing of their loved ones. ”ANGEL” is an automated “virtual caregiving assistant” that will call your loved one’s landline or cellphone to ask guided, conversational questions, such as “How are you feeling?” and “Have you taken your medications?” “ANGEL” will respond to your loved one’s answers and then translate your loved one’s self-reported answers into alerts, reports and actionable items in the app or via notification to keep you up to date on your loved one’s care. 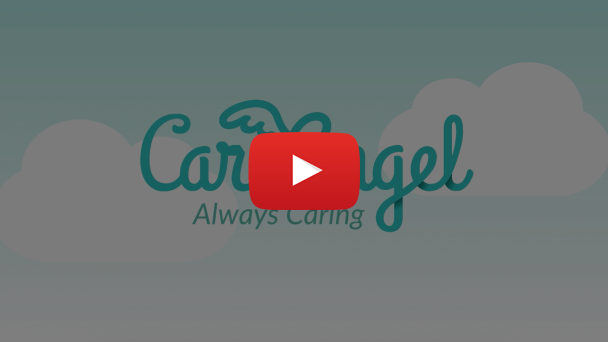 Introducing Care Angel and ANGEL, the world’s first Artificially Intelligent Caregiver. ANGEL is an award-winning, patent-pending A.I. Powered Healthcare Assistant that is pioneering the Science of Artificially Intelligent Caregiving available via a simple phone call. Low tech and high touch to the care recipient, she keeps family connected, improves outcomes, and lowers costs while improving quality of life. With a simple 1-2 minute Care Call, ANGEL, uses Artificial Intelligence (AI) and voice recognition to empower aging-in-place seniors and other care recipients to live healthier, safer and more independently. At the same time, ANGEL greatly augments the family caregiver’s capabilities to better care for their loved ones and for providers, payers, employers and health systems to care for the sickest & costliest populations. By leveraging Care Angel’s powerful yet simple Check-in Care Call technology, payers, providers and other partners can tap into AI-powered TeleCare automation with simple telephones to scale their managed care, population management, and post-discharge operations, while lowering risks, cutting costs and improving outcomes. AARP Services Inc., founded in 1999, is a wholly owned taxable subsidiary of AARP. AARP Services manages the provider relationships for and performs quality control oversight of the wide range of products and services that carry the AARP name and are made available by independent providers as benefits to AARP’s millions of members. The provider offers currently span health products, financial products, travel and leisure products, and life event services. Specific products include Medicare supplemental insurance; credit cards, auto and home, mobile home and motorcycle insurance, life insurance and annuities; member discounts on rental cars, cruises, vacation packages and lodging; special offers on technology and gifts; pharmacy services; and legal services. AARP Services also engages in new product development activities for AARP and provides certain consulting services to outside companies.